Why Does the Salatin Model take 20 Acres? Why Does the Salatin Model take 20 Acres? That’s an excellent question someone asked the blog. Though I have only met Salatin once and can’t begin to read his mind, I’m willing to take a stab at it. This is my opinion, not his. It doesn’t take 20 acres. He suggests what is possible with a mere 20 acres. But since I have 20 acres I’ll explain why I think it’s a good number when you are starting out. First, 20 acres isn’t a lot of ground. It’s an amount of ground that could be purchased for a reasonable price when the book “Pastured Poultry Profits” was published in the 90’s. If the idea is to get in cheap and get rolling quickly, buying 20 acres generally fits the bill. If you get started and decide raising chickens isn’t for you then you could still keep the land as recreational ground or take a stab at growing something else. An acre will raise 300-500 broilers depending on how fast they grow out, how good your feed ration is, temperature, rainfall, bug population and numerous other factors. Let’s just say 400 birds per acre per year. As pointed out in the book, once your broilers spend a day on an area of ground you’ll need to wait until next year to bring them back. Otherwise you’ll saturate the soil with nitrogen and (probably) kill or at least damage your grass. If you are buying in all of your feed (as Salatin indicates in the book) and using all of your land for poultry production (assumption in the book) and the land is relatively flat, level and well drained you can raise 8,000 Cornish Cross birds in a year. But wait, there’s more. His goal is to net you $25,000. That means each acre of birds has to put $1250 in your pocket over expenses. So you have to buy the chicks ($1 each), feed each bird 15 pounds (or $4.50) worth of of feed. 300 birds at a time are brooded together then split up into groups of 60 in chicken tractors. Along the way you’re paying for the brooders, lamps, water, electricity and time handling. Then, once in chicken tractors, you take time each day to feed, water and move them. At my efficiency level, by the time the birds are grown I have spent about 2 minutes with each bird. It takes me a further 2.5-3 minutes per bird to kill, dress and pack them. That time is worth something. You aren’t going to process many birds alone so you’ll have to pay some help. Finally, the purchase price of chicken tractors, processing equipment, fence and freezers have to be spread across multiple batches of birds across a number of years…adding to your costs. If you don’t buy processing equipment, add in the cost of transportation and processing off-site. SO, to net $25,000 on your 20 acres you have to make $3.13 above costs for all 8,000 birds. OK. That’s not too bad. Let’s say the birds average 4 pounds and you are charging $4/pound for the whole bird. You have just made your margin. But you still have to sell 8,000 birds. That takes time. Our first three years were 500, 900 then 1200 birds and I suspect we’ll stay at or below 1200 next year. Salatin outlines a similar schedule. It takes time for you to learn marketing. It takes time for word of mouth to spread. It takes time to build skill with the livestock, learn about seasonality, learn how to process and package. It takes time to train customers to buy in bulk rather than just a chicken or two every other week. But you only have to manage 20 acres while you’re learning and growing your small business. If you are looking to get started, have room to grow and ultimately earn a fair portion of your annual farm income from seasonal broiler production, read the book and get to work. If $25k doesn’t quite go far enough you could augment your income with any number of additional enterprises on the same land. Anything from large market gardens, pecan trees, cows, sheep, apples, nursery stock…who knows. Let your imagination run wild or check out Salatin’s other books (especially You Can Farm and Family Friendly Farming) and works by other authors like Making your Small Farm Profitable for lists of suggestions. 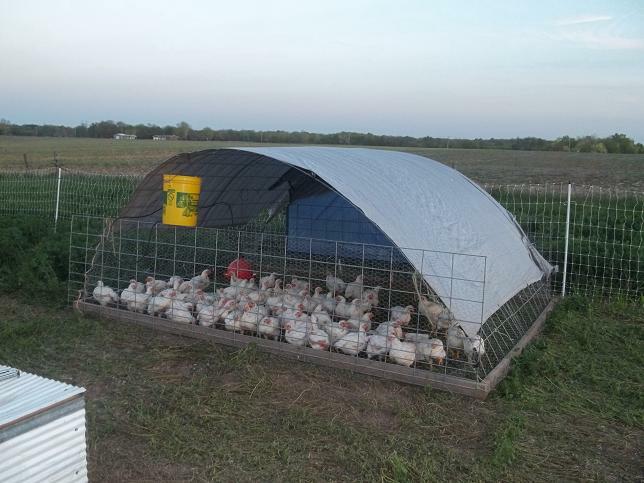 The chickens are just one option to boost your small farm income. But that, I think, is why Salatin suggests a small parcel: manageable costs, manageable workload, steep but manageable learning curve. Again, the book lays out what is possible with 20 acres but in no way requires 20 acres. One acre will keep you busy with chickens the first year. Now, if you really want your noodle baked, he suggests elsewhere that you should rent until you build wealth then buy to preserve your wealth. Stay light, portable, flexible and out of debt. Pastured chicken is the new black. Who knows what tomorrow will bring. This entry was posted in Pastured Poultry and tagged Pastured Poultry Profits. Bookmark the permalink. I am trying to buy a mint condition international harvester string square baler at an auction today. What does that have to do with the above? You might ask. Well the dirt the baler is currently selling at the drop of the auctioneer’s hammer for $11,500 an acre. Class a and b soils on flat prairie. It will be 7 months before we find out if that baler works or not. Even if it does, I doubt if we are finished using the green one. It has worked hard for us for a long time and still makes a great bale. Which will be the spare? I admit, I have not gained a great deal of equity from this model yet myself. Partly this is due to creating infrastructure and tweaking our system here for efficiency, which has taken us a couple of years. Partly there is a jurisdictional difference. Salatin says in the book and he’s absolutely right – his model is profitable because he (and you) process on farm. I am forced to pay for that at $3.10/bird currently. I am never going to get rich with this as my primary model – I do far better with laying hens, for example. That said, the broilers are a great complementary enterprise for me, and they are an excellent way to learn chicken husbandry very quickly. Right. But even if you process at home, it costs you SOMETHING to do the work. You have to account for these costs when determining your price because you may as well do nothing for nothing. Further, no matter how many acres you have you’ll only have broilers on each spot for one day each year. You’ll have to find other ways to capitalize on that resource the other 364 days. If you can’t figure something out, it doesn’t matter if you rent or buy. You won’t stay. Can you spend $11,000/acre for deep, fertile, Illinois dirt? It depends. You’ll be far more productive per acre raising chickens, cows AND nuts than the guy paying the same amount to grow corn. Just don’t be in a position to get hurt when that group of commodity farmers overextend their positions and crash land prices. Watch your profit margin. Do a little something extra. Sell, sell, sell. Above everything else, Salatin is a great salesman. Of course you’re right – processing costs something no matter how it’s done. But doing it with your own labour and with no transport costs is bound to be a smaller expense than the way I do it. Basically the goal is to keep costs down, so that more of the price is profit. And Salatin points out in his processing chapter that it’s easier on the birds as well – which is undoubtedly true. I was being facetious when I suggested paying for that piece of prairie with broiler chickens. What a waste of great soil if all you did with it was pastured poultry – absolutely I agree with you. And I love the nut tree idea…. In “Pastured Poultry Profits”, the whole back section of the book is old newsletters from Polyface which give a great glimpse into how Salatin grew his business. Chicken first, only a few hundred, then a side or two of beef, then a side or two of pork, some eggs, and suddenly, he’s running. Yes, he’s a great salesman, and I think he says somewhere (probaby “You Can Farm”), that the days when farmers could stay in their barns or fields, avoiding pesky other people are long gone. We can’t all be quite as evangelical as he is, but we do need to have confidence in our products enough to get vocal directly to other people. It’s a hard learning curve for many, and it might be why some farmers stay in commodity farming – so they don’t have to deal with people. Which baler will be our primary baler? The bigger picture is it is summer, 95 degrees, the hay is ready, the weather calls for showers tonight and the baler we are using just broke down and we don’t have parts, now we have a spare baler and can get our hay up in good condition. Dry hay waits for no man and the rule of thumb is if you want it to rain mow hay. you could be like my hay guy and have both balers going at once, like gang plowing only with balers…and get done in double time, especially with that weather scenario…but then you need two tractors. Worse, we would have to pick up hay from the ground. Ugh. Just gotta say, I love putting up hay! I love cutting it, raking it, baling it, riding the wagon or driving the tractor, seeing a wagon full of well cured hay, putting it in the barn, going in the hay mow and smelling summer all winter, remembering which cutting and which field a bale came off of, and planning how I can put up quality hay in the future. I even love trying to outthink nature to get it put up.